To view Justice Speedlin's interactive scheduling calendar, click here. Originally raised in Ohio, Justice Speedlin moved to San Antonio in 1970 during her service with the United States Army Nurse Corp. She completed her undergraduate education in nursing at Incarnate Word College and obtained a master’s degree in health care administration from Trinity University in San Antonio. She received her law degree with distinction from St. Mary’s University School of Law. Before becoming a jurist, Justice Speedlin practiced trial and appellate law for 17 years with the San Antonio law firm of Clemens & Spencer. 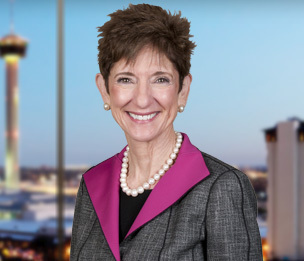 As an attorney in San Antonio, she represented clients in numerous industries, with a significant focus on the healthcare industry including doctors, nurses and hospital administrators on medical malpractice and medical product litigation. Today, Justice Speedlin counsels Dykema clients in two primary areas: alternative dispute resolution - including arbitration, mediation and private judging - and appellate strategy. To read Justice Speedlin's complete curriculum vitae, click here.